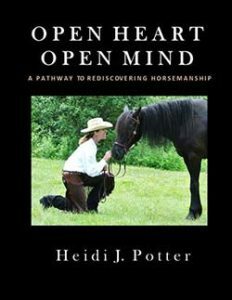 In Open Heart, Open Mind, A Pathway to Rediscovering Horsemanship, Heidi shares the value of mindfulness, understanding and compassion towards horses with exercises, case studies and lessons in horsemanship. This book has something for all horse lovers, whether you are an accomplished equestrian, an educated trainer, a therapy program volunteer or brand new to horses. Order your copy today and take the first step in creating a more enjoyable, safe, trusting partnership with your equine friend. 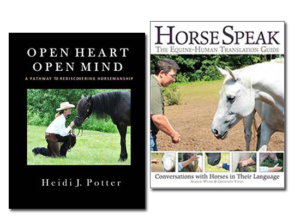 Open Heart, Open Mind & Horse Speak 2-Book Combo Offer! This Combination Book Special will provide you with all you need to begin again. Open Heart, Open Mind will bring about renewed awareness of yourself, your energy and how you affect your horses’ behavior and performance. This book includes valuable insights and tools to help you become the person your horse needs you to be. You are half of the partnership! Horse Speak will give you the exact and specific means to be able to enter into a meaningful conversation with your horse. It will open your eyes to all he is saying within the herd and to you directly. It really is an Equine-Human Translation Guide as it teaches you the real language of the horse. You’ll learn how to listen and how to respond in a way that makes sense to the horse. These books will lead you to a more holistic, truly natural, pathway to rediscovering your horse. 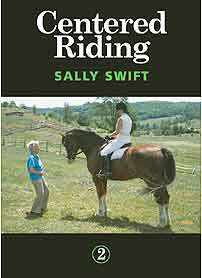 Buy both books for the price (or less than) a one-hour riding lesson and keep the lessons forever! Order yours today and bring your relationship to the next level. Enjoy! Shipping to U.S. is $6.50. Please contact me about cost of shipping outside the U.S. If you are looking for advice concerning your horses’ behavior, evaluating a horse prior to purchase or problem solving on the ground or under saddle then let’s talk. Sending in a video prior to your call can assist in helping both you and your horse. However, this is not a requirement. Centered Riding® is an innovative way of expressing the classical principles of riding, using body awareness, centering, and imagery. Centered Riding® encompasses all seats and styles of riding. It teaches a language that allows clearer communication between horse, rider, and instructor. 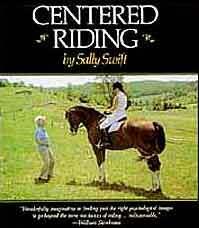 Centered Riding® was developed by Sally Swift, author of the best-selling book and videotapes, and is now taught by Centered Riding Instructors around the world. A fun sport that builds clear, positive communication, improves confidence and creates a stronger bond between you and your horse! A great how-to and reference book, includes training tips, obstacle courses and instructions for building and creating all the obstacles. Seeing is believing – watch horses and humans in action on obstacle courses and at liberty in the wild. 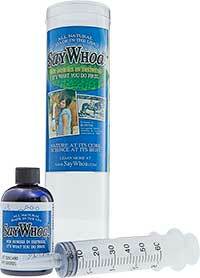 SayWhoa! is a revolutionary, all natural product that promotes normal digestive “flow” to assist with bowel movements.Horses may become dehydrated and impacted by simple acts of severe weather changes, an abrupt change of feed, long rides, stress and at times for reasons unknown. SayWhoa! promotes the normal flow of digestion. It is packaged in two pre-filled syringes that are both administered to any horse or foal over 100 lbs.This is a common sense approach to keeping digestive tract moving. The product is unaffected by cold or heat and has a 5-year shelf life. I keep one in my horse trailer and one in my barn.